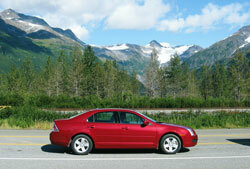 Putting together a driving itinerary for a family vacation in Alaska is no easy feat. Driving distances, varying interests and priorities, budgetary considerations, tour times, and other factors all come into play when customizing and planning an Alaska family vacation. We recently did a 9-day Alaska driving vacation using Gray Line of Alaska's "Alaska by Car with McKinley Explorer" package, which helped put together the basic framework for our trip. Even so, much time was spent filling in some of the details. Given below is the itinerary we used for our Alaska trip in late August and early September. It worked well and would be suitable for a family with kids in junior high, high school and/or college. Families with younger children might want to look into some of the alternative options and suggestions provided for various days. Although we used Gray Line of Alaska for our trip, this itinerary could easily be used for a completely independent tour. All of the hotels we stayed in were excellent and very family friendly. If you're planning to visit Alaska on your own, plan to reserve hotels early, especially for vacations during June, July and August. Although our trip was during the start of the shoulder season, some of the hotels were already sold out for the first few days of our vacation. Our vacation package included hotels, train reservations aboard luxury glass-domed railcars, a rental car, transfers and a number of tours. We added an extra night and rental car day at the start of our trip to give us more time to adjust to the time zone difference and explore the area around Anchorage. If you are planning a fully independent trip, take a look at the Great Alaskan TourSaver book's website for possible discounts and savings on hotels, tours, flightseeing trips, admission to museums and attractions, and other activities. If no State Fair and/or no rental car: visit the Alaskan Native Heritage Center in Anchorage; rent a bike and ride the Coastal Trail to Kincaid Park in Anchorage; take the Prince William Sound Glacier Cruise & Tour (transportation provided); see Seavey's WildRide Dog Sled Show in Anchorage; or take a flightseeing trip. Alternative options: Drive to the town of North Pole to see the Santa Claus House and reindeer; visit the University of Alaska Museum on the University of Alaska Fairbanks campus; take the Riverboat Discovery Trip paddlewheel riverboat cruise; visit the Large Animal Research Station of the University of Alaska, Fairbanks (otherwise known as the Musk Ox Farm) to see musk oxen, reindeer and caribou; or spend tour the museums and exhibits at Pioneer Park. Arrive Denali at about 12:15 p.m. Alternative options: Take a 5 hour Natural History Tour (only goes to milepost 17); take the shuttle bus for a shorter distance into the park, get out and hike, and then take the shuttle bus back; take the free National Park Service sled dog kennel tour; Denali has a Junior Ranger program for children ages 6 through 12 -- stop at the main visitors' center for more information and details on how your kids can become Junior Rangers; consider a river float trip or a river rafting trip; or visit four-time Iditarod champion Jeff King's Husky Homestead. If you have your own car, you can drive into Denali National Park up to milepost 14. Only National Park Service buses are allowed beyond that point. Board the McKinley Explorer Train at 12:40 p.m. Arrive Anchorage at about 8 p.m. Alternative options: Go on a river float trip or a river rafting trip; take a Mt. McKinley flightseeing tour; or take the shuttle bus for a short distance into the park, get out and hike, and then take the shuttle bus back. Alternative options: rent a bike and ride the Coastal Trail to Kincaid Park in Anchorage; take the Prince William Sound Glacier Cruise & Tour (transportation provided); take a flightseeing trip; visit the Alaska Native Medical Center's gift shop to purchase native craft items; or see Seavey's WildRide Dog Sled Show in Anchorage.